Custom engagement rings can be made in store. Set up a private appointment to discuss ring options. 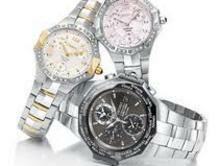 We carry a wide variety of watch desings that fit your personal style. We carry a wide variety of colored stones for pendants, rings, and earrings. We carry gold and silver chains that are available in different lengths. We have a new line from Angelica that carry bracelets and can be customized to your style. We carry diamond earrings, colored stones, silver, and gold.